Fact: Except for when I need to, I walk around everywhere barefoot because I dislike shoes. I chose to come to Belhaven because... first, I desired a firm foundation for my major. 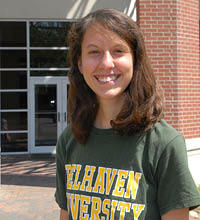 Belhaven provided me with solid Christian teachers who set good academic standards and encourage thinking critically. Second, the community on campus is wonderful. When I visited Belhaven as a prospective student, I felt such a sense of hospitality that I knew it would be a good choice to attend. One relationship that has meant a lot to me while attending Belhaven University... I know it should be one relationship, but I cannot choose between the influences of the Layton twins, Kelsy and Kaylee. They both have helped me so much in my spiritual growth, and I thank the Lord that He has brought them into my life. I have had many memorable experiences with them, and my life would not be the same without them. Because of my degree from Belhaven University... I feel more adequately prepared for graduate school. Through academic and spiritual challenges, I have grown quite a bit and gained a great deal of insight about adult life after college.